The largest ever containership to call at the port on the Elbe berthed in Hamburg early on Thursday morning, March 15. 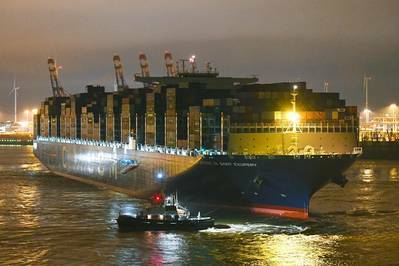 The oceangoing giant CMA CGM Antoine de Saint Exupery made its maiden call at the Port of Hamburg's HHLA Container Terminal Burchardkai (CTB) where it will discharge approximately 7,000 TEU and load 4,000. The 400-meter-long CMA CGM Antoine de Saint Exupery, delivered to French owner CMA CGM earlier this year, has a capacity of 20,776 TEU. End-to-end, those containers would cover a distance of over 125 kilometers. The mega ship sails on the FAL 1 service (French Asia Line 1), which connects Asia to Northern Europe. With one heave, gantry cranes at Burchardkai can lift two 40-foot or four 20-foot containers, with a total weight of 110 tons. No less than 30 such cranes operate at HHLA Container Terminal Burchardkai, half of them mega-ship gantries. Burchardkai has two high-performance berths for handling the new 20,000-TEU containerships. Their booms extend over a mega-ship’s entire width – of 24 boxes in a row. CTB has 13 of these cranes in operation, up to nine of which will be used simultaneously in handling the CMA CGM Antoine de Saint Exupery. HHLA’s terminal staff – including crane drivers, stowage planners, van carrier drivers, foremen, supervisors and many others – will work on the ship almost continuously in seven eight-hour shifts. HHLA has planned around 470 staff shifts to enable the CMA CGM Antoine de Saint Exupery to keep to schedule and leave Hamburg punctually. "We are absolutely delighted to welcome our new flagship here in Hamburg for the first time," said Peter Wolf, CEO of CMA CGM Germany. "She will play a key part in regular services between Asia and Northern Europe. That our largest vessels for decades are calling the Port of Hamburg demonstrates, not only our belief in the port, but also our efforts to achieve continuous growth on the German market. In recent years, CMA CGM has become one of world merchant shipping’s top groups. We aim to consolidate that position." Last year the Port of Hamburg reported more than 930 calls by CMA CGM vessels. Around 9,000 seagoing ships a year reach the Port of Hamburg, about half of these being containerships. Since the first calls in 2015, the number of vessels with a slot capacity of over 18,000 TEU has tripled. In 2017 alone, there were 102 calls by VLCVs in the 18,000-20,000+ TEU segment, or an increase of over 52 percent. This trend involves challenges, not just for Hamburg, but for ports worldwide. "Growth in containership size has rapidly picked up speed in recent years," said Andreas Brummermann, Deputy Port Captain at the POrt of Hamburg. "However, the Port of Hamburg is very well prepared for these VLCVs." "By investing in state-of-the-art gantry cranes and storage technology, we prepared ourselves at an early stage for this growth in ship size," said Jens Hansen, HHLA Executive Board member and Chief Operating Officer. "But we are not only making progress on the quayside. At the same time, we have implemented measures to deal with peak loads of incoming/departing containers caused by the arrival of VLCVs reliably and securely. In November 2017, for instance, a slot booking procedure for trucks was introduced that has already successfully overcome numerous ‘peak situations’ and is increasingly gaining acceptance from all those involved. In addition, the successful expansion of the Altenwerder rail terminal and the one planned for this year at the Burchardkai rail terminal will consolidate our integration with European hinterland rail services." Ingo Egloff, Joint CEO of Port of Hamburg Marketing, said, "That CMA CGM Group should send its flagship to Hamburg is further proof of our ability to handle these mega-ships and an endorsement from the shipowner of this port. It underlines its trust in the Port of Hamburg’s ability deliver the goods. All this is vital, since as an exporting nation we depend on the Port of Hamburg’s ability to perform."